2014 has been a good year for myMEGusta in terms of spiny lobsters! First there was a trip to Baja, Mexico, near San Diego, CA, where we feasted at Villa Ortegas, a renowned spiny lobster restaurant in the town of Puerto Nuevo, known worldwide for these tasty crustaceans. Months later, in Playa del Carmen on the shores of the Caribbean Sea, they reappeared. Traditionally Mexican in Baja, the lobsters were served with refried beans, rice, tortillas, salsas and limes, intended to be consumed forkful by forkful or made into delicate little soft tacos, seasoned to taste. Traditionally Italianate in Playa del Carmen (see myMEGusta’s recent posting “Pasta on the Riviera!”), the sparklingly fresh lobster was simply dressed, in olive oil, fresh tomatoes, and basil, tossed with freshly made tagliatelle. Most of us from the Northeastern United States tend to disparage the spiny lobster, as we usually get it in Florida restaurants where it is served with butter and simply does not deliver on the flavor profile we expect, that of our beloved cold water beasts from Canada, Maine and elsewhere in New England. The trick with the spiny is to serve it more imaginatively, like the chefs of Mexico have mastered. The texture and flavor of the lobster meat are complemented beautifully by accoutrements like those salsas and Mediterranean flavors. 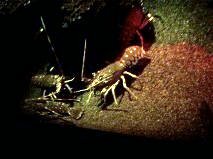 One curiosity for myMEGusta is how different but closely related species of warm water lobsters manage to be found on both sides of the Americas, in the Atlantic and in the Pacific Oceans, in fact in most warm water seas around the world. Summarizing a scientific article* on the subject, spiny lobsters don’t just live in warm water and can live in deep, cold water as well. Hence, they migrated all over and inhabit all of the earth’s oceans, but distinct species live in separate geographical regions, and some of the transitional species are extinct, found only in fossils.